Do I Need to Change My Workouts If I Want to Get Pregnant? 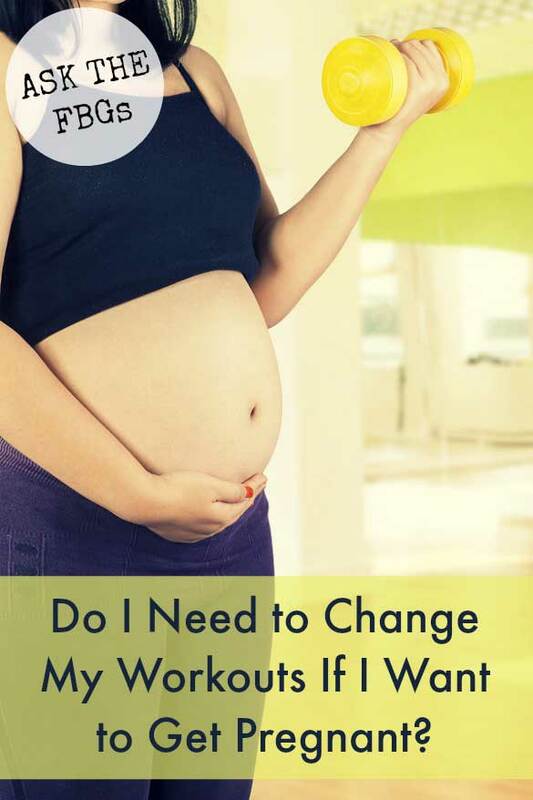 Ask the FBGs: Do I Need to Change My Workouts If I Want to Get Pregnant? Today we’re featuring an Ask the FBGs post, where readers like you ask the FBGs for advice. Nothing is off limits, although we do prefer that it’s fitness or nutrition related, so send your undying health questions to AsktheFBGs@fitbottomedgirls.com. You just might see them posted on the site in the future! I exercise (cardio and strength training) three to five times a week. Should I change my routine to a “pregnancy-friendly” one as soon as I try to get pregnant? Getting pregnant may take time, and I do not want to leave my routine as long as it is safe. I’m five-foot, four-inches tall and about 140 pounds. I’m planning to lose 10 pounds before start to try to get pregnant. I like exercising at home, so I’m a workout DVD girl. Bob Harper, Jillian Michaels, Amy Dixon and Michelle Dozois are my favorites. So I think I can describe myself as an intermediate/advanced exerciser. On my exercise days, I do 30 minutes of cardio, 30 minutes of strength training and 20 to 30 minutes of yoga to stretch. In general though, our recommendation is to keep up with what you’re doing and maintain your healthy and fit lifestyle (including eating healthy fats!). If it takes more than a few months to get pregnant, you may want to nix the super high-intensity stuff, as there’s some research that says that it can delay conception in those who are at normal weight. But moderate intensity (anything where you can still talk a sentence or two at a time) is all good! Exercise can help you to reduce stress and improve blood flow though, which are critical for getting pregnant. Not to mention that once you do get knocked up, you’ll be able to work out more during pregnancy because your body will be used to it. But, of course, talk to your doctor. Every woman is different, so listen to your body and do what feels good! Let us know once you go from Fit Bottomed Girl to Fit Bottomed Mama, Tuba. Best of luck as you expand your family! I had this same question and found that there was very little real research on the subject. What Jenn mentioned about the one study about super hard exercise delaying conception for some is all that I found, so I decided to scale back just to be safe when I started trying to get pregnant, just to be safe. I now believe it is necessary to scale back workouts to get pregnant. I suffered from several years of unexplained infertility and it wasn’t until I calmed my body down by finding alternative less stressful workouts and acupuncture that I was able to get pregnant. I plan to ramp back up after this pregnancy but will switch it back again when we go for baby #2!